Who cares what the neighbors think? 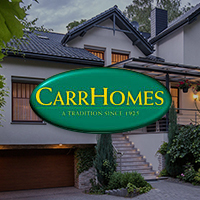 CarrHomes does. A lot! Herndon, VA –When we recently announced the beginning of sales, at our new Herndon, VA. single-family home community, Shaker Knolls, we didn’t have an office or model. So you can be sure we did have our fingers crossed. Almost immediately, though we received two contracts, both from existing neighborhood homeowners. And that’s probably the most important lst endorsements CarrHomes could have hoped for. First, it suggests our purchasers knew and liked the neighbors/neighborhood enough to want to buy there again. Two, who knows the history and value of homes in a neighborhood better than the families who already live there? And three, because they are purchasing a home without an on-site model, it would suggest these families have done their homework by checking out CarrHomes and/or visiting similar models offered at our Hamilton, Va. community, Waterford Creek. So yes, we’re extremely interested (and proud) of what the neighbors think, because we thought Shaker Knolls would be a great place to live. Now. we know it. Thanks for the warm welcome, Herndon.